On Tuesday, June 30, Monami Maulik represented the Women and Global Migration Working Group in a UN panel discussion on migrant workers’ rights, held at the United Nations Headquarters in New York City. The panel celebrated the 25th anniversary of the International Convention on the Protection of the Rights of All Migrant Workers and Members of their Families (the Convention was adopted by the UN General Assembly on December 18, 1990), and aimed to address how this “core human rights instrument” must continue to guide and inform migration policy at the international, national, and regional levels. 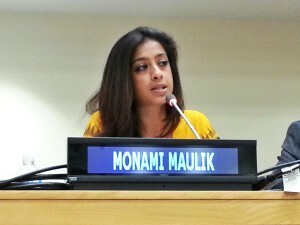 As the only woman and the only migrant on the panel, Monami contributed critically to the discussion as she described how “gendered and racialized stereotypes continue to invisibilize women in the migration narrative.” She identified exclusion from labor protections, criminalization of migration status, and violence against women as the most salient gender-specific barriers to migrant rights, and therefore as necessary targets of any “just, sustainable, equitable, gender-sensitive” development model. 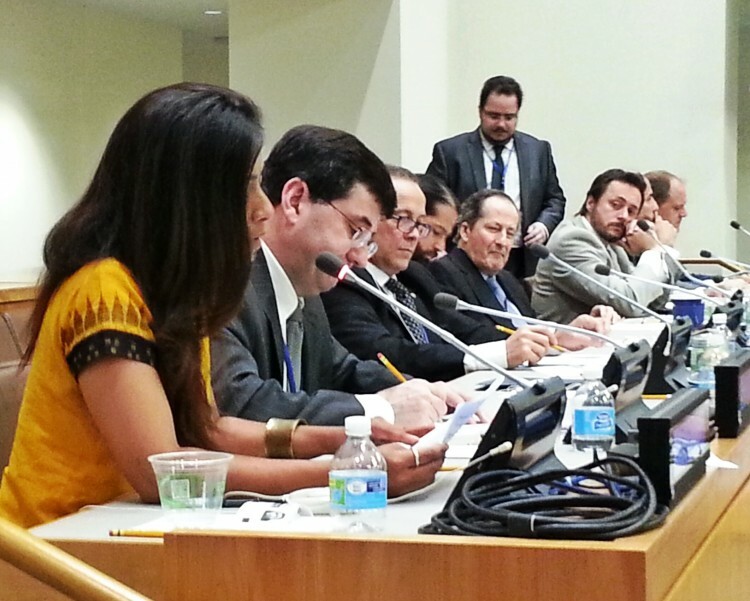 The panel was convened by the Permanent Missions of Argentina, Ecuador, El Salvador, and Mexico, and by the Office of the High Commissioner for Human Rights. Read Monami’s speech here, or scroll down the page for the full text. I would like to thank the Permanent Missions of Argentina, Ecuador, and Mexico and the Office of the High Commissioner for Human Rights for hosting this event and ensuring the voices of civil society in this process. As women, low-wage workers, and migrants from the global south increasingly comprise the over 232 million international migrants in the world, the need for migration policy rooted in human rights is more critical than ever. The Convention on the Protection of the Rights of Migrant Workers and Members of their Families has been a fundamental tool for women migrant workers and civil society organizations to raise public consciousness and advocate nationally and regionally for ratification and implementation of key rights and protections for migrant workers. The Women and Global Migration Working Group, formed in 2012 in Istanbul, has strengthened the leadership of migrant women and their civil society organizations to utilize the Convention to promote human rights protections, hold states accountable for violations, and mobilize new civil society networks globally. For instance, our member group, PICUM has lifted undocumented women’s access to services, justice and protection from violence in EU countries. Our member migrant rights and women’s groups in the US have worked to end family and child detention of asylum seekers from Central America. Migrant women through Migrant Forum Asia have advocated for justice and rights for domestic worker contract workers in Gulf States. In a global context of rising inequality and distorted development, climate change, conflicts, and neo-liberal globalization resulting in austerity programs, migration will only grow as a result of misguided policies that create the push and pull factors regionally and between the global south and north. Women migrant workers are particularly susceptible to displacement, violence in the migration process, increased burden of unpaid care work, and super-exploited paid labor. Women who remain behind when family members migrate also bear major burdens, as in Mexico or the Philippines where communities are left without working age men. Grave human rights crisis at borders and at sea in recent years have cost the lives of thousands of migrants. Women’s stories, whether in the Mediterranean Sea or Rohingya refugee crises, often are overlooked in the media and public discourse. Gendered and racialized stereotypes continue to invisibilize women in the migration narrative. Rising xenophobia in migrant-receiving countries and regions and the related lack of national policies to provide safe and legal pathways for migration are further challenges to realizing the rights guaranteed in the Migrant Workers Convention. Given these global patterns that driving migration and creating conditions that undermine human and labor rights, three critical gaps continue in realizing rights for women and all migrants. These are embedded in the UN Migrant Workers Convention. First, labor rights remain central for guaranteeing women’s human rights with the increasing feminization of labor migration. Migrant workers, particularly undocumented and temporary workers, still face widespread exclusion from labor protections, barriers of accessing workplace justice, and are prevented from joining unions or civil society groups because of justified fears of retaliation by employers and deportation. States, particularly those that rely on women’s labor migration in domestic work, and informal and other sectors, should ratify relevant international standards, including ILO convention 189 on rights of domestic workers and, of course, the Migrant Rights Convention. On the ground, extensive monitoring and enforcement of labor standards is needed, particularly for low-wage and irregular migrant workers. Beyond education and training of governments and employers, enforceable national laws and access to justice is critical for migrant women workers. Second, the Migrant Rights Convention guarantee to protect rights regardless of status faces severe challenges as states move towards more punitive, enforcement-based migration policies. Border militarization, the increasing use of detention (including of women and children), and severe human rights violations in conditions of detention need greater monitoring and action. Migrants should not be criminalized for seeking escape from poverty, conflict, or displacement, but rather states and regions should take responsibility to their pull factors of relying on cheap migrant labor. Globally, there is a need to increase regular channels for migration and family re-unification, particularly for low-skilled or low-wage work migrants. Finally, more research and resources should be placed towards working with governments in moving away from detention as solution as well as holding corporations accountable for severe rights violations in a growing private detention facilities globally. Lastly, violence faced by women is central to the migration process- as a driver of migration, in transit, and in destination. This often includes border and enforcement agents, recruiters, family members, and employers. Undocumented women and low-wage workers, particularly, cannot seek redress for fear of being deported. States should incorporate CEDAW as well, including General Recommendation 19 on VAW and 26 on migrant women workers into national law and address gender inequalities that both drive and lie within the migratory process. States must adopt laws that provide greater shelter and legal recourse to migrant women experiencing gender-based violence. In regards to development, just, sustainable, equitable, gender-sensitive development would put people at the center of the development agenda. It would help to create decent work for all based on sustainable models of production and consumption. It would involve grassroots women’s voices in decision-making. Within the UN Post-2015 development Framework and as national policy, state should reassess current trade agreements and move away from temporary worker models of circular migration. These models increase risks of abuse and irregular situation where recruiters and employers can exploit women workers. Sending countries should not reply on labor export policies and remittances for development income. They should fulfill their obligations of development and providing public goods and services that prevent poverty and allow people the choice to stay. The core issue is not about “managing” migration; nor solely about “migrant women’s contribution to development,” or migrant women in crisis; and it most definitely is not simply adding “women” to the current migration & development paradigm. The issue is a flawed development model that relies on the hyper-exploited labor of migrant women while building legal and physical barriers to their movement across borders and criminalizing their presence in destination countries. Nations benefit from their labor and their remittances, yet fall short to protect their social, economic, cultural, political, [and] human rights. The Women and Global Migration Working Group uplifts the critical and growing relevance of the Migrant Workers Convention in the coming decades. We will continue to build the leadership of civil society, and particularly of migrant women’s organizations, to advocate for our governments to ratify and implement the Convention as well as other critical related instruments of CEDAW and the ILO. Women migrant workers should not be seen as a victims in this coming process to uplift and realize rights, but as central agents of change, in our home countries, in the places we transit, and in the countries we make our new homes in and contribute to.